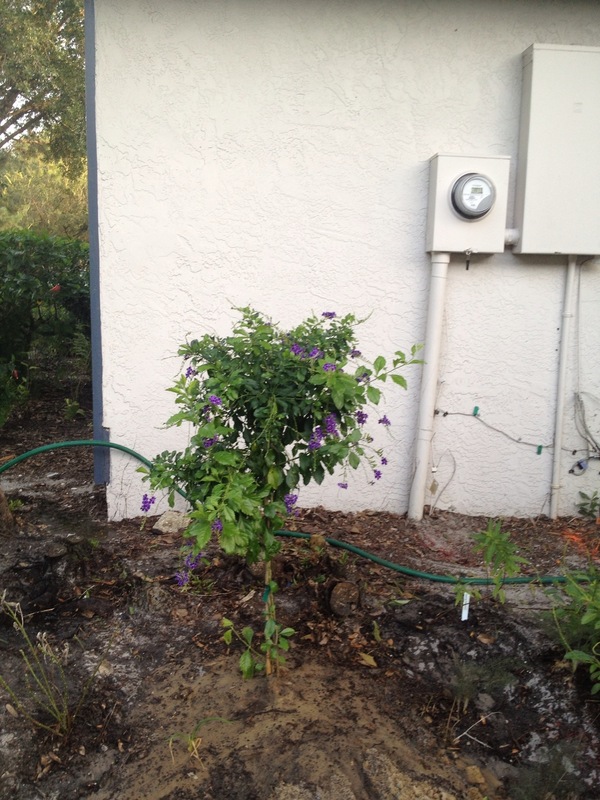 Earlier this week, I posted about my effort to find a suitable location in which to install my new plant, Duranta erecta, also known as Sapphire Showers. This new plant is shown above. My goal has been to use this plant to solve several simultaneous landscaping challenges. First and foremost, I would like for this plant to obscure the electric meter and other utility interface boxes from view. I need to leave access to these fixtures, but I don’t need to leave them fully exposed to view from the road or the yard. After studying the placement of the underground utility cables, I decided that the best location was just a few feet from where I had originally planned to place it. Secondly, there are some unsightly stumps in this area, and I would like this plant to shield them from view as well. The stumps themselves are leftovers from some very thick greenery that I took out last year when I started my butterfly garden. Some of that greenery was a cluster of the highly invasive camphor tree, and some of it was anise bush (Illicium parviflorum). Although that is a decent landscaping plant, it was originally planted too close to the house, and it was becoming increasingly difficult to manage. There are actually numerous stumps clustered closely together at various angles ranging in size from about half an inch to four inches or so. I have trimmed them as close as I can to the ground, but there’s still quite a bit left. As best I can figure, it isn’t worth the effort or scraped knuckles it would take to get them the rest of the way to ground level or to remove them by hand. They are also too close to the house to safely operate a stump grinder. So, my goal for now is to simply make them less visible while they slowly decay over the coming years. If you look closely, you will see these stumps in some of the pictures I post now and then. 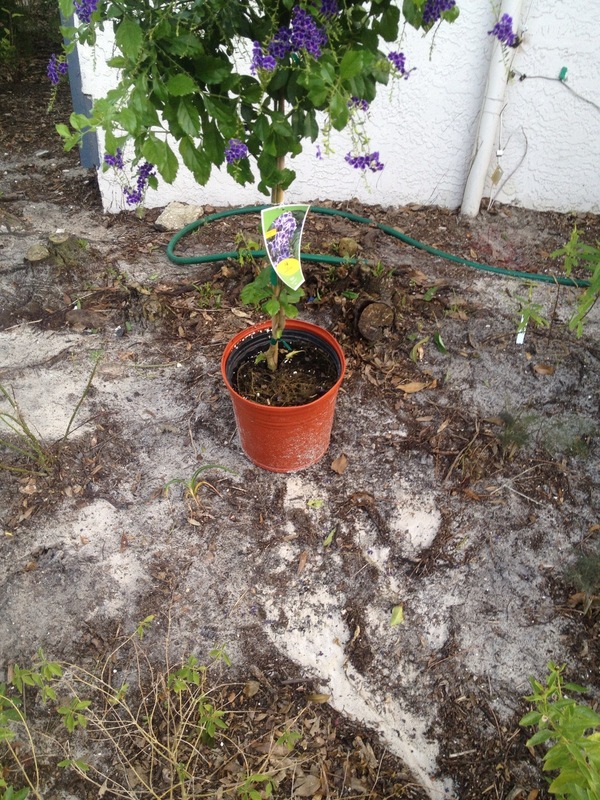 A third goal for this plant is for it to be an integral, positive addition to my butterfly garden. I have a patch of ground in that garden that has gone bare over the last few weeks, presenting a good opportunity to rework the design. My thought has been to place this plant in that section. When this section is viewed from the front, the first foot or so above the ground is hidden by several rows of flowers and low-to-the-ground flowering shrubs. You can see this perspective in the picture below. 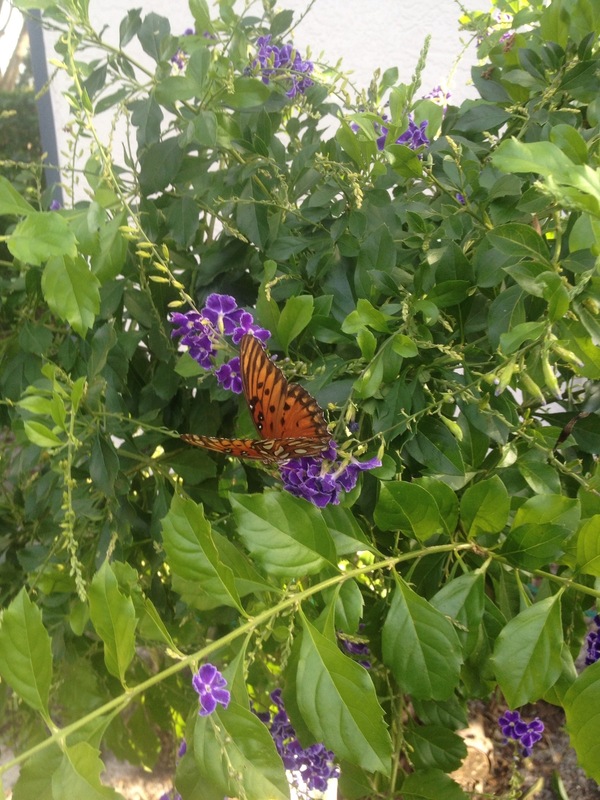 All of those plants are species native to Florida, and all of them serve as nectar sources for adult butterflies. Species represented in this section include Lantana depressa, Salvia coccinea (Scarlet Sage), Rudbeckia hirta (Black-eyed Susan), Gaillardia pulchella (Indian Blanket Flower), Coreopsis lanceolata, Silphium integrifolium (Rosinweed), Scutellaria lateriflora (Blue Skullcap), and Asclepias tuberosa (Butterfly Milkweed). All of the plants in that section produce showy flowers that attract adult butterflies in search of nectar. But if you really want to attract butterflies to your garden in large numbers, it is imperative for you to plant sources of larval food, that is, you need to feed the caterpillars. Nearly all butterfly species are highly selective with respect to the types of food they can eat as caterpillars. As adults, the females will seek out those plants as a place to lay their eggs. They then hatch out as caterpillars and happily munch away until it is time to pupate, and then emerge as adult butterflies. The butterflies seek out nectar sources for sustenance, seek mates for reproduction, and the cycle continues. So the key to successful butterfly gardening is to plant larval sources specific to the butterfly species you wish to attract, and to plant a variety of nectar sources sufficient to entice the adults into hanging around instead of wandering off elsewhere in search of food. 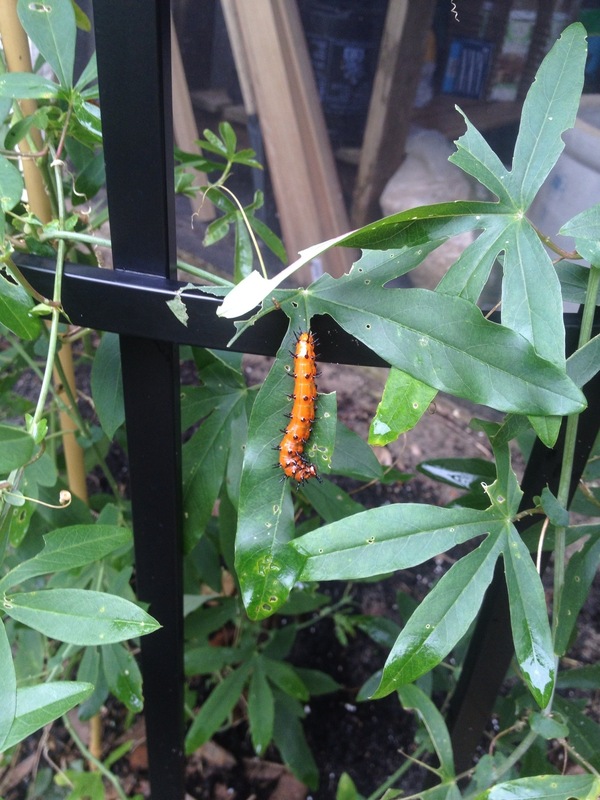 Because the larval sources in a butterfly garden are intended to be eaten by caterpillars, it is a fairly common practice to position them in places where they are not visible to most passers-by. This is what I have been doing (with mixed success) in what has become a largely bare patch. There are still a few specimens left in this patch, but they blend in so well with the sandy ground and leaf debris, they are nearly invisible at first glance. An example of this is bronze fennel. There really are three decent sized bronze fennel plants in the picture below. They are all along the right-hand side of this picture, but unless you know what to look for, you will have a really hard time finding them. Can you spot them? By the way, bronze fennel is a favorite of the Black Swallowtail butterfly, and I have had several of them start their lives here since I started this butterfly garden. I see them fairly frequently nowadays. Another favorite of the Black Swallowtail is rue, which is the plant that inspired the design of the clubs symbol on a standard deck of playing cards. I had several of these in this area, but they all suddenly and mysteriously died in recent weeks. There are also several species of foods that humans eat which serve as larval sources, although I do not have any growing here yet. This includes parsley, dill, fennel (the edible kind), carrots, and others. Expect to see some of these show up here in a future post once I figure out how I want to integrate these food crops into my butterfly garden. Some plants serve dual purposes as both larval and nectar sources. A classic example is the genus Asclepias, commonly known as milkweed, as mentioned above. There are many species of milkweed, several of which I have growing in my butterfly garden. All of them serve as larval food for the Monarch. In fact, Monarch caterpillars are incapable of eating anything other than milkweed. Milkweed grows natively throughout North America, but it usually gets taken out along with other native vegetation when land is developed. This is why gardeners planting milkweed is so crucial to the survival of this beautiful and unique species of butterfly. Just a couple days ago, I found the youngster below, happily munching away on one of the many milkweeds in my garden. Monarch caterpillars are voracious eaters, and will strip a milkweed of its leaves and flowers in a matter of days, leaving nothing but nubs and bare stalks. If you look near the left-hand edge of the picture above, at about the same level as the pot, you will see what a milkweed looks like once the caterpillars get through with it. This actually does not harm the plant; it will bounce back completely in a couple weeks or so. Another plant that serves a dual purpose is the genus Passiflora, commonly known as the passion vine or passion flower. These take up considerable space, so at this time I only have one specimen, a P. caerulea, or blue passion vine. These serve as hosts for two of the butterflies we have locally, include the Zebra Longwing (our state butterfly) and the Gulf Fritillary. 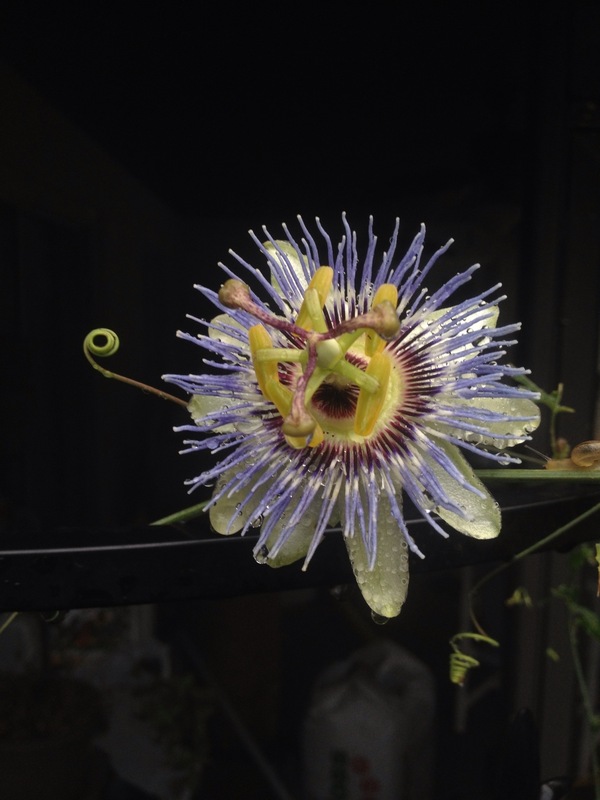 Passion vine flowers are short-lived, but incredibly exotic looking. In the picture below, you can see one that was in my garden a couple weeks ago. One day it was a bud, the next day it was as you see below, and by the third day, it was gone. While present, butterflies will stop by for a drink. 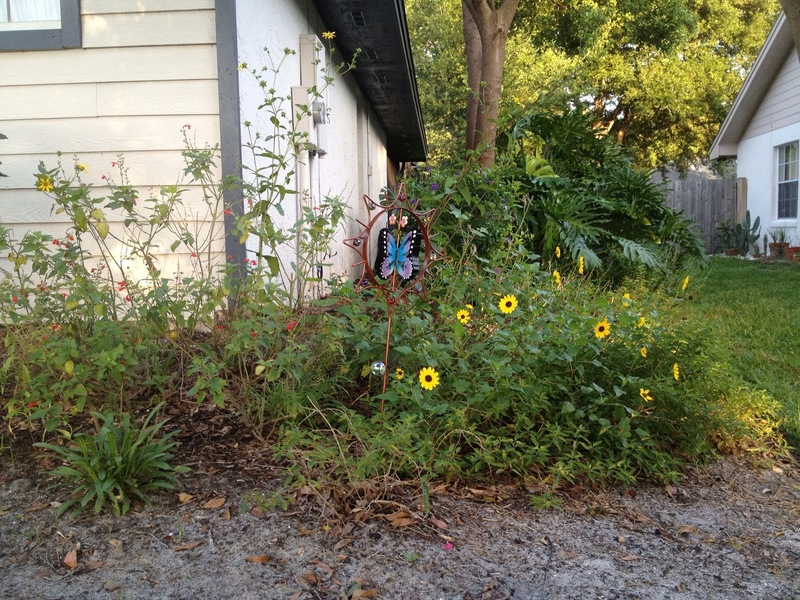 In the picture below, you can see what the vine looks like, along with a Gulf Fritillary caterpillar. As adults, they look like the one shown back up at the top in the first picture of this blog post. There you will see it enjoying my new plant, even before I placed it in the ground. Take note of its size relative to the flowers on the Duranta. In the next picture, you will see another butterfly that stopped by during the time I was conferring with my wife about the placement of the new plant. Look closely. It is mostly white with some black markings, and it is on a flower very near the center of the picture. You will note that this one is much smaller than the fritillary. This butterfly is not familiar to me. I am not 100% sure, but I believe it is a female Checkered White. I arrived at this conclusion after consulting my copy of the Butterflies of Florida Field Guide. If any of you are butterfly experts, please feel free to correct me! Also in that same short time, a butterfly of a third species paid us and the Duranta a visit. This one was a tiny blue butterfly that was too small and too quick for me to get a picture. By consulting my book, I determined that it was probably a Cassius Blue. The largest specimens of this species have a wingspan of only an inch. I don’t grow any of the larval host plants for either of these species, so we may or may not see some return visitors. Nonetheless, we very much enjoyed the show while it lasted! When the butterfly show ended, I proceeded to install the new plant. 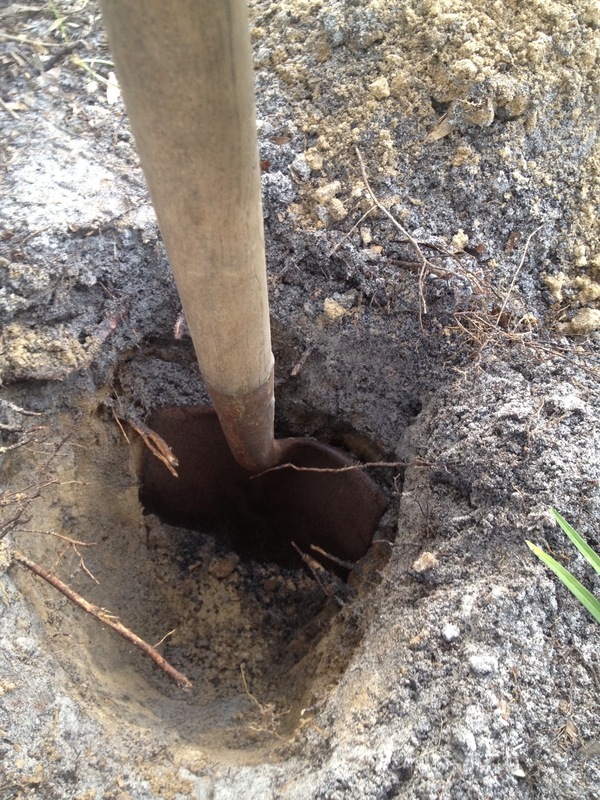 As you can see by looking at the shovel, it took quite a hole to place it in the ground properly. I had remarkably few roots to deal with, so the digging was fairly easy. It was very nice knowing with certainty that I was digging well away from any utility cables! Once I finished the hole, I filled it partially back in with some Mel’s Mix, augmented with some Plant Tone organic fertilizer. After placing the plant, I filled the hole the rest of the way with Mel’s Mix, tamped it down, and watered it thoroughly. So, in this final picture, you can see the finished product. There it is, perfectly centered between the naked milkweed stalks and the invisible fennel! Ah, the joys of gardening! Until next time, happy gardening!! Love the thought process behind the placement of duranta erecta. I don’t think I’ve seen that shrub around here, or perhaps I have and didn’t realized it because it wasn’t blooming? In any event, you’ve given me something new to research and learn about! Thank you! I’m so happy to live in an area where butterflies are abundant and where its easy to grow their larval host plants…total win win! 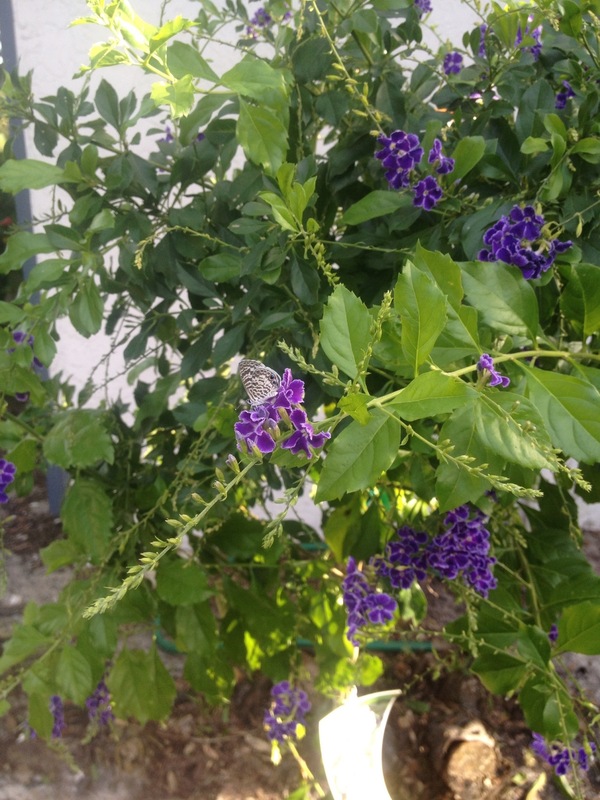 Love the Duranta- hope we can find more of those! 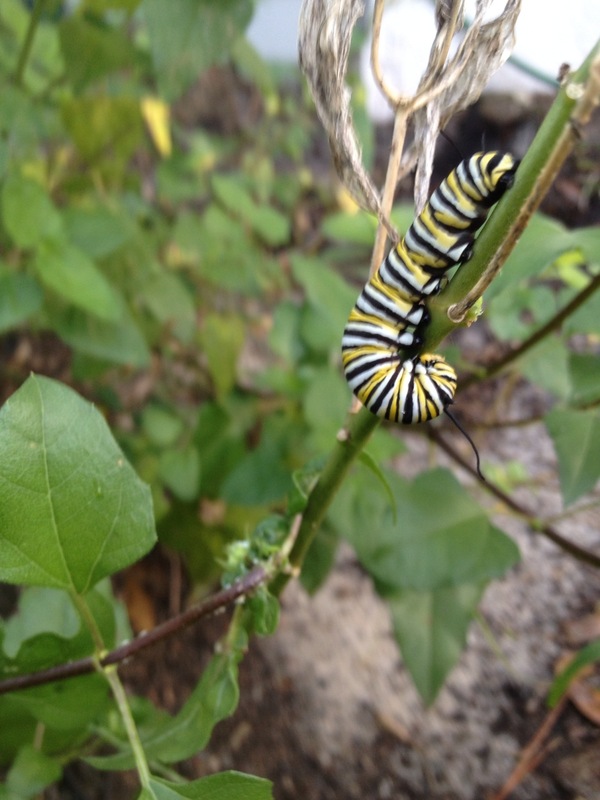 Very informative post…especially the info on milkweed and monarchs. Thanks for sharing!